I rewatched Star Wars: The Force Awakens over the weekend, and as these things tend to do with me, I had some thoughts. I was watching as Rey saved BB-8 from the scavenger, and something struck me: why does Rey do that? 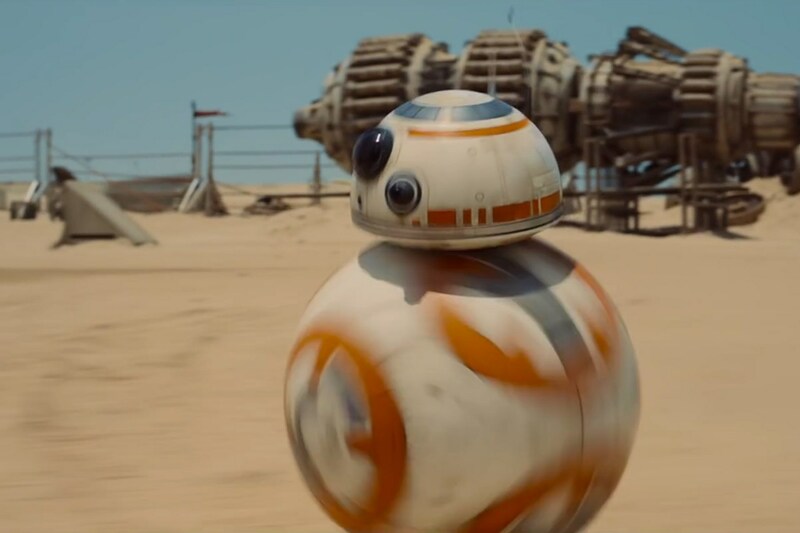 OK, so, part of it is obvious: Rey is a good person and BB-8 is a little guy needing help. It’s obvious. We could even suggest something within the Force suggested to Rey she rescue the small droid. Well, let’s stop there for a second. Droids, we are told, aren’t alive, and don’t even think on their own. They are machines and tools to be used according to their respective programming and functions. Different droids do different things. So, why should Rey care if a droid, even a cute one like BB-8, is being dragged away? Why does she feel sympathy for BB-8 and let him stick around and then protect him from thieves? If it was just about her owning the droid, why not sell it for the portions? She relates to the droid that she just met more like a friend than anything else. This is hardly the first time we’ve seen this reaction in Star Wars. The original trilogy shows the protagonists having great concern for keeping R2 and 3PO around…you know, except for Han who doesn’t much care for droids in general. Here’s what it comes down to: are droids, any droids, artificial intelligence within the Star Wars universe? Or are they just capable of doing what their programming tells them to do? Do they have feelings, or do they fake them due to some particularly sophisticated programming? Star Wars never really answers these questions in any of its various incarnations. Episodes of the Clone Wars animated series have even suggested Anakin Skywalker’s attachment to R2 is somewhat unusual, but that R2 always proves himself worthy of that faith. Mostly, droids given personality at all are often there as comic relief. We know they aren’t alive in the conventional sense. That is how R2 and 3PO’s escape pod escapes being shot to dust in the original movie. Obi-Wan says they are incapable of thought in Attack of the Clones, and battle droids in every incarnation seem to bear this idea out. Most droids seem simple and stupid, with the exception of key characters like R2, 3PO, and BB-8. But if the droids are alive in some sense, what does it mean that people own them? This is hardly an old question when it comes to Star Wars or even sci-fi in general. The robot companion, no matter how cold and distant, has often been a character that audiences connect to, to say nothing of other characters within the story the robots appear in. And, truth be told, Star Wars as a franchise has never been the hardest of sci-fi, the sort that really explains how the universe works, the technology involved, and the closest the series came to explaining the Force has been roundly ignored since then. Star Wars, however, is not unique. Consider, if you will, how much John Connor begs a nameless Terminator not to destroy itself in the second movie from that series. The robots need not even look particularly human. Coop really bonds with the ATM-like TARS in Interstellar, and that machine doesn’t even have any sort of conventional face. We’re not even considering those stories when the robot or computer turns on its human companions. The characters in the story and we the fans outside of it are just addressing the machines as friends, or at least as something smarter than a hand tool. Perhaps the best attempt to find a way to answer this question came from Star Trek: The Next Generation. In the episode “The Measure of a Man,” the cerebral captain of the Enterprise Jean-Luc Picard defends the rights of autonomy for his android crewmember Data. Picard successfully proves Data is a sentient being who can make his own decisions, and not the property of Starfleet to be disassembled at the Federation’s whim. That, of course, is the sort of question that Star Trek would try to answer. Star Wars was never intended for such questions as the series is more there for a rollicking good adventure. That doesn’t stop the questions from being asked, and fans know the questions won’t be answered. In the end, it’s probably not best to think about it too hard. Otherwise, we might come to the conclusion that some of our favorite fictional characters are slaves, and that would rob us of the fun those stories provide. Coincidentally, I just bought this as a birthday present for my wife, and we watched it Saturday. Concerning the whole AI thing, it depends on our definitions of life and consciousness. If mind is body, then a living mind can be defined as a structure that initiates and maintains three-dimensional patterns of electrochemical activity. If this is true, mind might be reduced to those very patterns. This raises the question of what makes us so special, but the more pertinent question has to do with whether or not the previous definitions are correct. Of course, we can inject some ethics into our science fiction by asking what qualities make a mind good. Somehow, patterns just don’t get it. This level of deep philosophical and metaphysical talk would seem out of place in most sci-fi anyway, when they’re mostly trying to get space and time travel down. I think that’s one of the reasons I liked that Star Trek episode so much, where the judge basically says Data having a soul is an unanswerable question, even for other people, and decides to err on the side of the idea he does. But in the real world, people get attached to inanimate objects all the time. I would imagine one that displays any kind of personality would make it easier to that. If a person can get attached to a car or a boat, then a droid should be easy.